Schwimmer berni diplomáciai szolgálatáról a korábbiakban Glant Tibor, Litván György, Peter Pastor és Szapor Judit publikáltak, azonban a New York-i hagyatékában korábban nem ismert forrásokra bukkantam: a többségében Károlyi Mihállyal 1945–1948/1949 között váltott levelek Schwimmer és húga azon erőfeszítéseit dokumentálják, amelyek révén az 1918/1919-ben elmaradt követi fizetését kívánva kifizettetni a magyar állammal. Schwimmer Rózsa levelében arra kéri Károlyi Mihályt, hogy az általa az Egyesült Államokban 1914-ben összegyűjtött pénzből fizesse ki azt az összeget, amellyel a magyar állam svájci diplomáciai kiküldetése óta tartozik neki. This will sound like a business letter. But it is a question of live and death that compels me to write you in this matter. Could you arrange that, out of the funds you collected for the Kossuth Party in the United States at the outbreak of the war in 1914 and which became frozen assets, a sum would be paid to me, if the money is still in the United States and you are able to dispose of it? In 1927, I was denounced for deportation, accused of having been a communist agent and having served Bela Kun’s regime. During my Ellis Island examination my presentation of the original two uncashed orders and copy of my letter explaining I would [olvashatatlan szó] them only if the order were defined and payment for my services to the Károlyi regime, saved me from deportation. These documents will appear in Photostat in my book. I bring all this up because the friends who had financially supported me for years have been deprived of their own means in countries over-run by the Germans, amongst them my Dutch friend, Mrs. van Wulfften Palthe who called on you with me in Paris. For the last few years Mrs. Lola Maverick Lloyd alone supported me and she died last July. I have been increasingly ill and spent most of my time during the last two years in hospitals To my twenty-nine-year old diabetes all kinds of physical complications were added for which my physicians cannot find any explanation or a solution. The chief trouble is a pathological sleeping condition – a type of sleeping sickness, but not the routine one. The papers reported me dead three times, and sometimes I meet people who look at me as if I were a ghost, having thought me dead. Just a year ago there was a day when I was nearly dead. At that time I had plneumonia and para-typhoid, was under cancer-suspicion, all at once. But here I am, holding on for two purposes: one, to finish the book on which I am struggling for years, and the other to carry on the international part of an attempt to establish popular provisional world government, for which the blueprints and the people are all available, but no money to start the work. The greatest blow struck me when Lola Maverick Lloyd (my team-mate for thirty years and sole financial supporter for many years) died unexpectedly. She had been very sick for many years, but five hours before she died three reputable physicians had declared that in three months she will be on her feet again. The American peace movement lost its only leader of absolute integrity, and it is characteristic that even on her death-bed she was working on some material for world government. Having no citizenship because of our uncompromising pacifism, and though stateless, being counted as alien enemies, my sister and I are restricted in earning our living. We are legal residents, which means we have the legal right to live here but nothing else. So we are living now on capital Mrs. Lloyd left me. The sum would have helped out for several years if serving only as supplement to our earnings, but it will hardly be enough for our full living expenses for more than another year and a half, my medical needs devouring fantastic sums. If nothing is added to my money here, I cannot count on finishing the book which is not autobiographical but important as a historic document. This is the reason I ask whether you could pay me what your regime owed me. I hope that you and the Countess and your children are physicaly well enough to endure our nightmare life. Schwimmer’s post service attempts to receive her salary, 1945–1949. New York Public Library. Manuscripts and Archives Division. Rosika Schwimmer Papers. Series III. Box 485.4 Másolat, gépelt. Rosika Schwimmer Diplomatic Service Accounts 1918/1919 Diary Notes, transcripbed by Edith Wynner. New York Public Library. Manuscripts and Archives Division. Rosika Schwimmer Papers. Series III. Box 552. Másolat, gépelt. Károlyi válasza Schwimmer április végi levelére. Április 24-i levelét megkaptam és nagyon sajnálom, hogy nem adhatok kielégítő választ. Az Amerikában gyűjtött pénzhez egyelőre nem tudok hozzáférni. Ez annál is inkább sajnálatos, mert megértem helyzetét, és értékelem kérésének méltányosságát. Amennyiben mégis visszakerülök Magyarországra, és módon lesz az állam ügyeibe belefolyni, igyekezni fogok igényének kielégítést szorgalmazni. Mint tudja, már megválasztottak nemzetgyűlési képviselőnek, de ennek ellenére még mindig várakozó helyzetben vagyok, mert nem kaptam még meg a hivatalos értesítést. Enélkül pedig nem térhetek haza. Jómagam nem vagyok olyan anyagi helyzetben, hogy a saját zsebemből folyósítsak Magának valamit, mert én is csak egyik napról a másikra élek, és éppen csak biztosítani tudom mindennapi megélhetésemet. 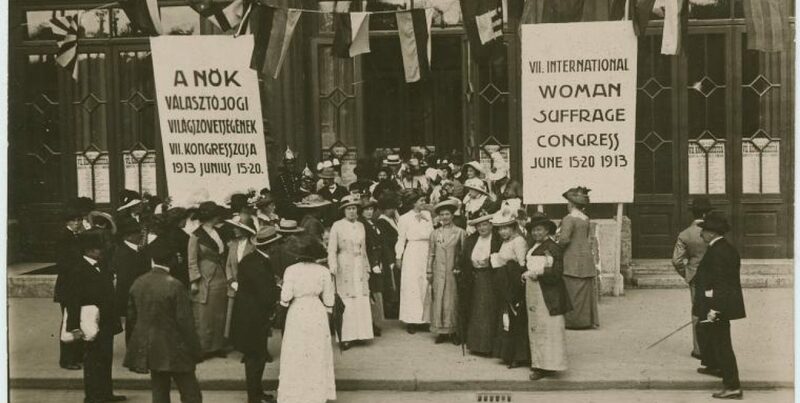 Amellett a feleségem[aki 1918 előtt szintén a Feministák Egyesülete tagja volt] is beteg. Most megindítottam a lépéseket perem újrafelvételére, illetve a pertörlésre, és erre egy magyar ügyvéd mellett egy neves angol ügyvédet is felkértem, aki vállalta az ügy vitelét. Persze, annak ellenére, hogy a pör kimenetele 100%-ban biztosítva van, az ügy még sokáig elhúzódhat. Azt sem kell mondanom, hogy a világért sem akarom birtokaimat visszakapni, hiszen azt már egyszer odaadtam a parasztoknak, sőt egyéb vagyonomat sem akarom, mert ellenkezne az elveimmel, hogy én legyek a szegény Magyarország krőzusa. Ellenben remélem, hogy a magyar állam majd jónak látja feleségemről és gyermekeimről gondoskodni, és biztosítja megélhetésemet öreg napjaimra. Ezt már megtiszteltetésnek fogom venni. A minap a múlt évben meghalt Spádi Adél[i][sic!] és más halottaink emlékének szentelt ünnepélyen magáról is megemlékeztem. Elmondtam, hogy milyen értékesnek találom a maga berni misszióját. Azok, akik azzal vádolták magát is, engem is, hogy maga mint nő nem tudott eredményeket elérni, nem tudott érvényt szerezni a wilsoni elveknek, megfeledkeztek arról, hogy maga Wilson sem tudott. Apponyi a nagy szakállával még annyit sem tudott elérni Trianonban, és még hosszabb orral és szakállal tért haza. Remélem, hogy hamarosan jobb híreket közölhetek, és csak annyit mondhatok, hogy nem feledkezem meg magáról. Minden jót, jobb egészséget és erőt. Schwimmer’s post service attempts to receive her salary, 1945–1949. New York Public Library. Manuscripts and Archives Division. Rosika Schwimmer Papers. Series III. Box 485.4. Eredeti, gépelt. Károlyi köszönetét fejezi ki a Schwimmer ismerőse által (családja számára) továbbított pénzösszegért. Mivel a Schwimmer levelének másolata nem maradt ránk, az adományozó kiléte ismeretlen. Károlyi méltatja továbbá Schwimmert a Bernben végzett diplomáciai munkájáért, illetve azokat az okokat gyűjti össze, amelyek mindkettejük politikai sikertelenségéhez vezettek. Egyben ígéretet tesz, hogy Magyarországra történő visszatérése után megpróbál érvényt szerezni Schwimmer anyagi követeléseinek. We received your letter with great delay as it was reforwarded several times. We had been away for several months owing to my wife’s illness. And now, upon our return, I had the visit, a few days ago, of Mrs. Rawnsley, who, to my amazement, declared that the purpose of her visit was to give us 25 pounds on your behalf ! And this at a moment […] was really badly needed! I must say I was deeply moved by the kind thought and generous gift of the anonymous donor. I do wish I knew who it is so that might personally express my heart-felt gratitude. Anyway please do tell that unknown friend that, should he ever need my help, I would be happy to reciprocate with anything which lies in my power. I of course understand that it was your influence which promoted this gift, and so our thanks equally go to you with our sincerest friendship. We may not always have followed the same political line, but I have always highly appreciated your diplomatic work at the time when you were the envoy of the Hungarian Republic in Berne, and I always deeply resented the outrageous attacks to which you were subjected. Although these attacks were directed against you, they were actually aimed at me. Nevertheless I am proud that I was one of the first European prime-ministers to entrust a woman, and such an able woman as yourself, with so responsible a diplomatic mission. We must admit that both of us – I as appointer and you as appointed – failed because we were unable to overcome the anti-feminist prejudice. Having once again backed the wrong horde – the Germans – Hungary has brought upon herself the second catastrophe. But the tide has not turned for, as you know, the National Assembly has recognized my services to the Nation. This however, applies not alone to me, but to all my collaborators as well, and therefore to you. Although we all have, since then, followed different paths, I feel a retrospective solidarity with our entire October team. Although I have no official authority at the present time, I shall certainly try upon my return to Hungary, to make it understood that the wrong done to you ought to be repaired. Catherine is taking a great risk by accompanying me to Hungary as her doctors disapprove of her travelling, but as she always has been my side through all these years, we certainly could not forego being together at this historical moment. While her presence will be a great support to me, I am at the same time dreading the consequences of this risky journey for her health. A Párizsi Magyar Követség instrukciói azzal kapcsolatban, hogy Schwimmer egy 1945-ben hozott törvény szerint minként szerezhet érvényt financiális követeléseinek, és miként kérheti a magyar államtól nyugdíjazását. 1945-ben törvényt hoztak, amely szerint azok a köztisztviselők, akik politikai vagy faji okokból vesztették el állampolgárságukat, visszahelyezésüket kérhetik. Abban az esetben, ha az illetők további szolgálattételre nem alkalmasak, nyugdíjazhatók és számukra nyugdíj folyósítandó. Bédy-Schwimmer Rózának tehát vagy a miniszterelnökhoz vagy a külügyminiszterhez intézendő kérvényt kellene benyújtania, amelyben erre a jogszabályra hivatkozik és szolgálatba való visszavételét kéri. Kérvényében egyúttal elő volna adandó, hogy kéri nyugdíjazását, amely esetben beszámítandó az elmúlt 28 év is, mert hibáján kívül nem teljesített szolgálatot. Természetesen helyes volna, ha Károlyi Mihály támogatását kérné. Nem ártana, ha a kérvényt ügyvéd fogalmazná meg és sürgetné az elintézést. Károlyinak egyik titkára, Simonyi Henrik ugyanigy kérte reaktiválását, illetve nyugdíjazását és ezidőszerint már élvezi is a nyugdíjat. Schwimmer ismételten Károlyi segítségét kéri, hogy hozzájuthasson az 1918/1919 folyamán ki nem utalt fizetéséhez, illetve visszautasítja azt a sajtóban is napvilágot látott vádat, amely szerint a magyar államtól fél millió Koronás juttatásban részesült volna, amit felelőtlenül költött el. Összesen 17 100 svájci Frankra tart igényt, hiszen a hiteleit is e pénznemben halmozta fel. I was glad to learn several months ago that the post-war Hungarian government had done all in its power to rectify the persecution and injustice inflicated on you and on many of those who worked with your regime in 1918/1919. It is so seldom that the victims of injustice live to enjoy vindication that this is one of the rare sources of satisfaction in these tragic times. I hope that my own small claim for the unpaid position of my salary as Minister of Hungary to Switzerland under your government will receive similar promt action. I now most earnestly hope that the present Hungrian government will at last discharge this debt of your regime and order the payment to me of the 17 100 Swiss gold francs 66 centimes due me since 1918/1919. May I emphasize again that this sum was due me in Swiss Francs, that I accumulated debts in Swiss Francs to make possible to discharge my duties on behalf of your government and that I request this payment now in Swiss Francs. I beg you to press this matter with all speed possible as I am in desperate need of funds and without prospect of improvement. I know that the present government is beset by shortages of foreign currency […]. Schwimmer’s post service attempts to receive her salary, 1945–1949. New York Public Library. Manuscripts and Archives Division. Rosika Schwimmer Papers. Series III. Box 485.4. Másolat, gépelt. Schwimmer Franciska levelének részlete Kemeny Györgyhöz, arról, hogy a magyarországi események mennyire negatívan befolyásolták nővére egészségi állapotát. Államtitkári válasz a Schwimmer által elküldött dokumentációra a fizetésrendezése és nyugdíjazása kapcsán. Az ügy még 1948 januárjában is függőben volt, ekkor azt az ígéretet kapta, hogy amint a Külügyminisztérium visszajelez a kérvénye elbírálásáról, azonnal értesítik. With reference to your letter enclosing material in documentation of your claim against the Hungarian government on the title of outstanding salary, I take pleasure in informing you that I have taken the necessary steps in order to have your claim considered without delay by the Hungarian Ministry for Foreign Affairs. A Párizsi Magyar Követség tájékoztatása Schwimmernek arról, hogy Károlyi, aki idő közben Budapestre utazott, magával vitte az általa küldött dokumentációt, hogy a kormánynál eljárjon ügyében. In the absence of Minister Michael Károlyi I am answering your letter which he received just before his departure to Budapest, where he will spend some two weeks. He authorized me to tell you that he took with him all the documents you sent and he will take the opportunity to present your case to the Government authorities. As soon as he will be back in Paris, will let you know the results of his invitation. Schwimmer Franciska távirata a Magyarország Pénzügyminisztériumnak arról, hogy nővére augusztus 3-án elhunyt. Kérte, hogy mielőtt utalják ki számára fizetését, amelyből törleszteni kívánta Schwimmer adósságait. Mód Péter miniszteri tanácsos tájékoztatása Schwimmer Franciskának arról, hogy nővére kérelmét elutasították, a fent említett összeget nem utalják át számára. Értesítem, hogy nővére – néhai Bédy-Schwimmer Róza – kártalanítás iránti kérelmét nem tartom teljesíthetőnek, s ezért azt a 4810/1946 M. E. számú rendelet 4. §-a alapján elutasítom. Schwimmer Franciska tájékoztatja Károlyit Schwimmer haláláról és a kártérítés kifizetésének elutasításáról. Kéri továbbá, hogy járjon el az ügyben, hogy számára fizessék ki a nővérének járó kártérítést, amellyel ahhoz is hozzájárulna, hogy (Edith Wynnerrel közösen) elkészíthesse Schwimmer életrajzát. My sister, Rosika Schwimmer, died on August 3, 1948. I had sent you the enclosed death notice but it may have gone astray as I have not heared from you not from Mrs Károlyi. I am also sending you enclosed a copy of the notice from the Hungarian Foreign Office informing me that my sister’s claim for the sum due her as a Hungarian Minister to Berne under your regime has been rejected under paragraph 4 of rendelet 4810/1946. A Budapest Lawyer friend of mine was good enough to copy out for me the […] paragraphs on which this decision is based and moreover explained that what is meant is that the Foreign Office has not rejected my sister’s claim but rather my right to it as her survivor since I am not considered her dependent under the interpretation of dependency of the Hungarian government. I would point out that eight months passed from the time my sister made her claim and her death and almost four months until I received notice of this decision. For your information I would add further that after my sister died, my friends who were going to attend peace congresses in Europe, decided to take me with them. It is thus that although, like my sister, I am stateless, with an American re-entry permit and affidavit of identity I did manage to accompany my friends to Great Britain, Luxemburg, Switzerland and Hungary. I was in Budapest from September 23 to 28 and learned that the Treasurs two months before, had transmitted to the Foreign Office its recommendation for favourable action on this claim. I then went to the Foreign Office and talked with Dr. [olvashatatlan név]. He had just returned after an illness and was not yet familiar with claim. He had the file brought down and assured me it would soon be acted upon by the Cabinet. I had the impression that a favourable decision in this case was likely. Now I beg you, as the legitimacy of my sister’s claim has again and again been recognized that you, under whose regime this debt originated, do inform the Hungarian Government that in fact I was my sister’s dependent. For as you know, for a good many years now, the increased medical needs of my sister necessitated my giving up piano teaching and we had both to live on the allowance she received from pacifist friends. My sister had great confidence in your assurances that when Hungary was liberated and you returned there, you would see to it that compensation was made to her. I trust that in her memory you will protest this rejection by the Foreign Office on a transparent technicality which has no bearing in this case that I can see. I am sixty-eight years old and wish to live long enough to assist the preparation of my sister’s biography. The sum due her these thirty years I need desperately of this last service to her. I trust, you will fulfill the confidence she had in your promise. Károlyi válasza Schwimmer Franciskának arról, hogy bár többször megpróbált közbenjárni nővére ügyében, erőfeszítései (az államosítások miatt) sikertelenek maradtak. I have to apologize for not having answered your letter sooner. The fact is that I have been travelling. On over Central Europe and it is only here, that your lines reached me. Not once, but several times I have asked the Government to settle the financial claims that I find justified. Unfortunately as you know, I was not successful. Since practically everything has been nationalized in this country I have not the means to refund you […] I have for the memory of your sister who has so gallantly fought the cause of peace. [i]Spády Adél (?–1944) a Nőtisztviselők Országos Egyesületének választmányi tagjaként működött 1911–1913 között. 1911-től a Feministák Egyesületének választmányába is bekerült, 1916-tól az egyesület néplapjának, a Nők Lapjának szerkesztőjeként dolgozott. Ugyanebben az évben rendezte sajtó alá a FE júniusra tervezett, ám az utolsó pillanatban a hatóságok által betiltott kongresszusának előadásait, amely kötet ittolvasható.